V Arc Architecture has designed a new headquarters in Melbourne for Treasury Wine Estates – the largest wine company in the world. Treasury Wine Estates is currently the largest wine company in the world, owning over a hundred wineries across Australia, Europe and America. 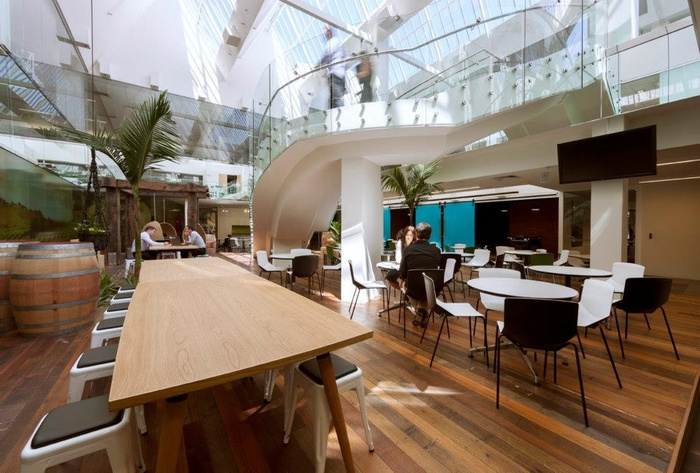 Their recent de-merger from the Fosters Group has inspired a fresh start for TWE, with their head office in Australia re-locating into a 6660m2 tenancy – The Atrium in Southbank. Key drivers for the design of this fit out were inspired by the TWE ‘vinetrepenuer’ motto of ‘One foot in the Boardroom, one foot in the vineyard’. The design incorporates contemporary office elements with reclaimed/rustic features that make reference to the lifestyle on the vineyards both past & present, with a number of highly customised joinery units designed for this fit out.